At Tomato Dirt, we like to grow tomatoes. 93% American gardening households (people like you) grow them, too. Like anything else, there are some special things to know about growing tomatoes and some pitfalls to avoid. We get excited when we share our gardening tips with you – and you find out that growing tomatoes is easy with just a little help from a friend. Most everyone agrees a fresh tomato tastes so much better than those bought in the store. That’s one reason growing them is so popular. Plus, when you grow your own, you have a continuous supply – enough for canning, freezing, drying, with some extras to share. Anyone can do it. Even if you live in a house with only a small yard or in an apartment patio, you can grow tomatoes in pots or containers. You can even grow them indoors. Don't know where to start? Take our easy crash course, "10 Must-Know Tomato Growing Tips." How do I grow tomatoes from seeds? Growing tomatoes in pots Tomato: fruit or vegetable? Tomato Varieties: determinate tomatoes, indeterminate tomatoes Staking tomatoes: the difference between tomato cages and tomato stakes Tomato nutrition facts: what are the health benefits of tomatoes? I promise to use it only to send you Tomato Dirt. Get your free, 20-page tomato growing guide that is filled with must-know tomato growing tips. 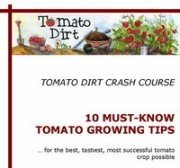 Sign up for the Tomato Dirt newsletter and get a free, 20-page guide filled with tomato growing tips. Tomato Masters is a friendly competition among tomato gardeners, earning winners bragging rights. Readers share their best tomato growing tips. How to understand the way tomato varieties are classified. What’s the difference between an heirloom and a hybrid? A determinate and an indeterminate? Where should you buy tomato seeds? Look in this online catalog of vendors who sell tomato seeds and tomato seedlings. How to buy tomato plants. What to look for in a healthy tomato plant. What to be aware of when buying tomato plants locally and when buying tomato plants from garden catalogs. You can grow tomatoes from seeds --it's easy and fun! Start 6 weeks early. Starting a vegetable garden successfully begins with planning. These tips help you plan what to grow, how much to grow, and where to grow it. Planting tomatoes successfully in the garden takes just 4 easy steps. Know when to time planting tomato plants, how to space plants, how to dig holes or trenches, and tips on planting. Staking tomatoes has distinct advantages. Tomato support means a healthier, more productive crop. Learn how pruning tomato plants can maximize the number, size, and flavor of your tomatoes. How to pinch suckers. When to prune side stems and roots of tomato plants. Mulch provides key benefits in tomato care. Find out when to mulch tomatoes, what kinds to use, and how to do it. Basic information about watering tomato plants. Find out what problems can arise with improper watering. Get your tomato watering questions answered. How to use tomato fertilizer throughout the growing season to get the best tomato production. Harvesting tomatoes at the right time means a tasty crop. How you can know when tomatoes are ready to pick. Special tomato harvesting tips. Successful composting requires four components: food, water, air, and heat. The result is a valuable soil amendment and conditioner for growing tomatoes. Why growing tomatoes in raised beds is fun, practical and easy. Five steps to take to set up raised beds. Advantages of raised beds for tomato gardening. Tips to get started growing tomatoes in pots. What you need to know to grow patio tomatoes in containers. Growing hanging tomatoes is a lot like other container gardening, but these special tips will help you get the maximum harvest and produce the healthiest plants. The top 6 most useful garden tools to use in the tomato garden. Which tools are must-haves for the tomato gardener? A description of garden sprayers, how they work, and how to choose one that’s right for you. Use a greenhouse to start or grow your tomatoes. Your two main considerations are what kind of structure you need and whether to build or buy your greenhouse. Grow fall tomatoes to get fresh produce until frost. Find out how to plant appropriate fall varieties, plant strong seedlings, and choose the best date to set fall tomatoes in the garden. How to grow indoor tomatoes on the windowsill, under growing lights, or in a greenhouse. What tomato plants need to successfully grow inside during the winter. Protecting tomatoes from frost and freezing is an important step to having healthy crop – both at the beginning of the season and at the end. Tomatoes are fun to grow, but they are susceptible to many tomato diseases. Learn how to identify and prevent them. Is It Too Hot For Tomatoes? How to know if it’s too hot for tomatoes. Will a heat wave kill your tomato plants? Find out when to use shade cloth. Problems on tomato leaves are most often caused by diseases or pests. Learn how to identify problems on leaves and prevent them. Problems on tomato stems are most often caused by diseases or pests. Learn how to identify problems on stems and prevent them. Problems on tomatoes are most often caused by diseases, pests, or conditions. Learn how to identify problems on fruit and prevent them. How to identify tomato problems and prevent them. Discover different symptoms of specific tomato pests that may be attacking your plants and how to treat infested tomato plants to keep them healthy. Blossom end rot is a common tomato problem caused by a calcium imbalance. Find out how to identify, treat, and prevent it. Preserving Tomatoes: Should I Can, Dry, or Freeze Them? Preserving tomatoes: should you can tomatoes, dry tomatoes, or freeze tomatoes? Know the advantages of each method. Canning tomatoes: basics you need to know about choosing a canner, how to prepare jars and lids, how to fill jars with tomatoes, and how to process them. What you need to know about freezing tomatoes. Ways to freeze tomatoes: whole or chopped, peeled or unpeeled, cooked or raw. Drying tomatoes is easy, cheap, and saves space. Find out the best kind of tomatoes for drying, how to prepare tomatoes for drying, and two secrets to successfully drying tomatoes. Tomato recipes: how to prepare tomatoes to use in cooking, sauces, and dishes. Tomato – fruit or vegetable? Find out the tomato’s true classification and why the debate rages today. Use this tomato glossary to understand terms about growing tomatoes and using them. Tomato facts, fun information and trivia. Interesting tomato nutrition facts and tomato food facts. 10 great gifts for gardeners from big to small, tomato seeds to composters. Tomato gardening quotes to inspire gardeners: see what noteables say. Why garden? Gardening inspiration. God in the garden. Gardening therapy. Tomato of the Month: learn about fun and interesting types of tomatoes from thousands of varieties. Determinate tomatoes, indeterminate tomatoes, heirloom tomato varieties, hybrid tomatoes. Tomato books about growing tomatoes, organic gardening, tomato varieties. Check out gardening magazines that offer tips, how-tos, and inspiration to help you have a healthy, productive tomato garden. It’s easy and fun to make a tomato costume. You can also buy a tomato costume for adults and for children. Tomato costumes are one more way you can “grow tomatoes” all year long! Funny (and some bad) tomato jokes! Take The Great Tomato Quiz to test your knowledge about tomato facts, the history of the tomato, and tomato information.